The Bursaries were awarded to applicants who provided evidence of membership of more than one of the target groups outlined below, and clearly demonstrated the significance and impact of the socio-economic disadvantage and barriers experienced. Students with a disability – particularly students with a physical/mobility impairment, students are who deaf/hard of hearing and students who are blind or have a visual impairment. Lone parents who have been confirmed by DEASP as holding a means tested social welfare payment. A Review and Appeal application can only be made by completing the Appeals form (below) and submitting it by email no later than 15th February at 12noon. Additional information or documentation will not be taken into consideration. Change of circumstances since the application was submitted will not be taken into consideration. The Appeal Process closes 15th February at 12noon. 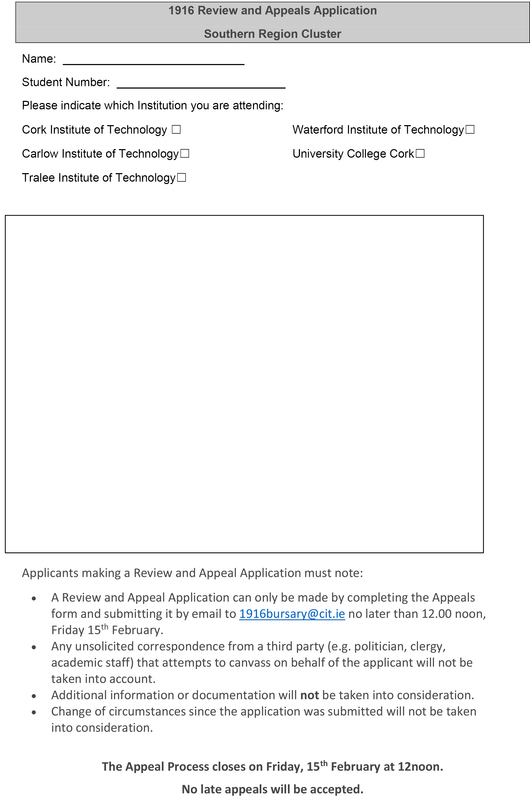 The offical Appeal Application form (below) must be used. No late appeals will be accepted.